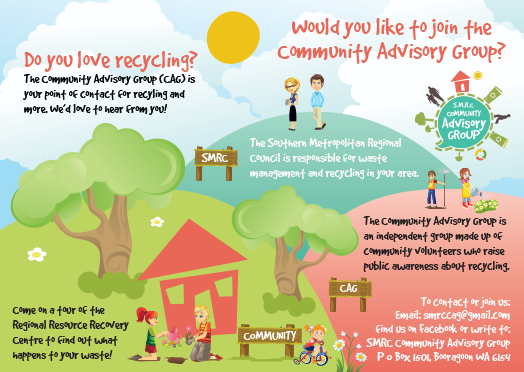 Top Tips in Your June Issue of the Recycle Right Newsletter! The ocean is full of plastic. And it appears that most of the pollution is microplastic - tiny, highly mobile particles. Alarmingly, plastic pollution has increased by 500% in the last 30 years. The plastic litter that finds its ways into our oceans kills over 100,000 wild animals every year. Each time we wash a shirt, jacket or other clothing made from man made materials such as polyester, nylon, or gortex, plastic microfibers wash into the sewage system and flow into the ocean. From there the microfibers are ingested by small fish and make their way up the food chain. Microfibers are not the only microplastics in the ocean. 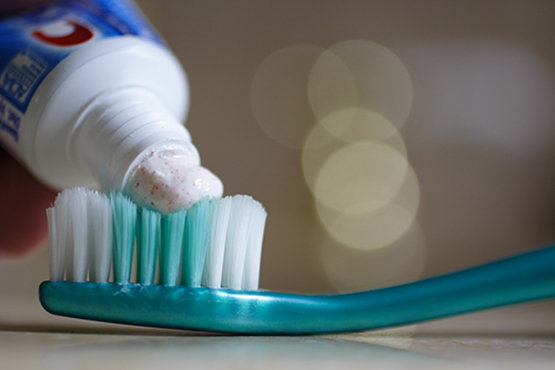 According to a study by the University of New South Wales, the exfoliating â€˜microbeadsâ€™ added to skincare scrubs are also entering the marine environment. Many cosmetic products, such as exfoliating body scrubs and toothpaste, contain tiny particles of plastic to gently abrade or clean. Microplastics also come from larger plastic debris, such as plastic bottles and bags, which have broken down into smaller particles. â€œWhen things get that small, it opens it up for 96 per cent of the worldâ€™s biodiversity, which are invertebrates, to potentially start ingesting them,â€ says researcher Professor Emma Johnston, from the Sydney Institute of Marine Science. These microplastics also appear to have the ability to bind with contaminants and are believed to have an adverse affect on the health of fauna. With this in mind, it is increasingly important to not only consider the packaging and disposal of an item, but to also think about its contents. Awareness is the first step in helping the environment. Sources: ABC â€œMicroplastic beads: how your exfoliating scrub might be harming the oceanâ€; The Story of Stuff â€œLeading the way for cleaner oceansâ€. 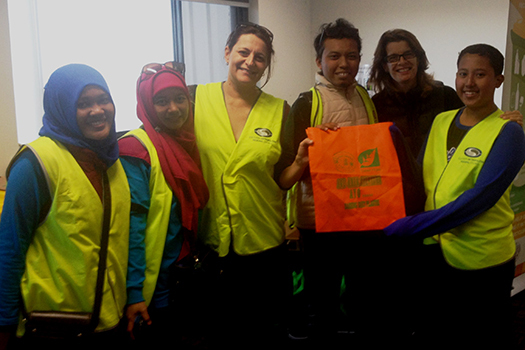 This month Millennium Kids, a youth environmental group, visited the RRRC to learn more about recycling and composting in Western Australia. The students were from Surabaya in Indonesia. Surabaya is Indonesiaâ€™s second largest city with a population of over 3.1 million. 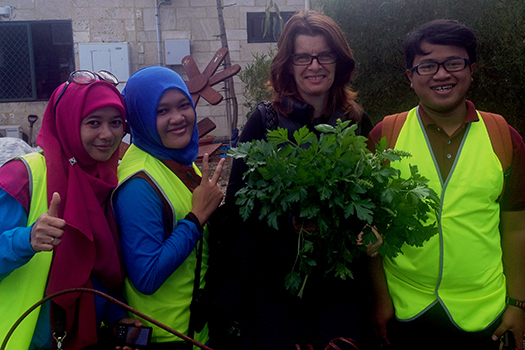 The students picked some herbs from the RRRC vegetable garden to use in their dinner that evening and presented Taryn with a re-usable bag. Each student at the school uses one of these bags instead of a plastic one - a great step to reducing waste! CAN I RECYCLE: BROKEN GLASS? Yes. 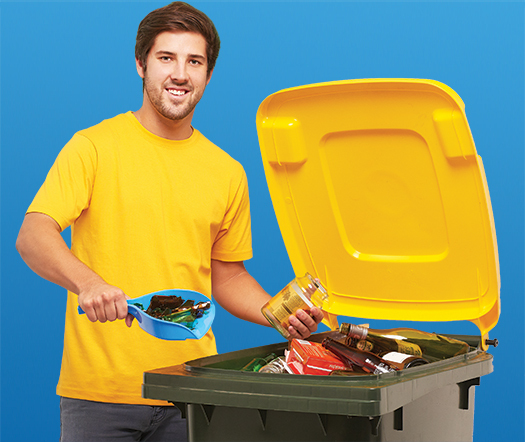 All glass and ceramics should go into your yellow-topped bin, even if they are broken and/or contain some food residue. If glass is placed in the green-topped bin it contaminates the compost we make from the contents of this bin. Friends of Ken Hurst Park are having a Tree Planting Day and need volunteers. 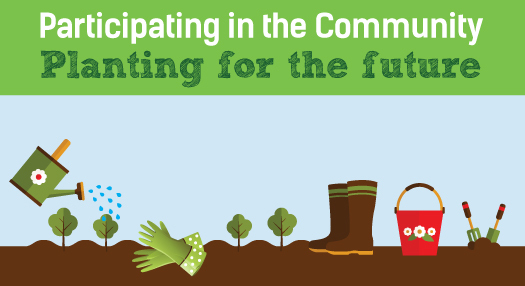 This is a great opportunity to help the environment and inspire positive change in your community. Planting Day will take place on Saturday 11 July 2015 at 9.00am to 12.30pm. Donâ€™t forget your gloves, bucket, trowel and rubber hammer if you have them. Please bring as much water as you can to water the new plants. Each week the Regional Resource Recovery Centre (RRRC) receives recyclables that have made a long journey from the Avon Valley region. Recycle Right staff Chloe Rothery and Emma Baker this month visited many of the schools in the area to talk about the importance of recycling and putting the right thing in the right bin. It was also a great opportunity to acknowledge the sustainable efforts of these communities. 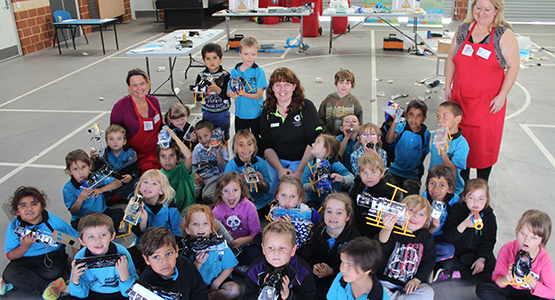 Teaming up with REmida, the creative reuse centre, students at Avonvale PS and Toodyay DHS created geckos and bees from materials that were previously destined for landfill in an art workshop. 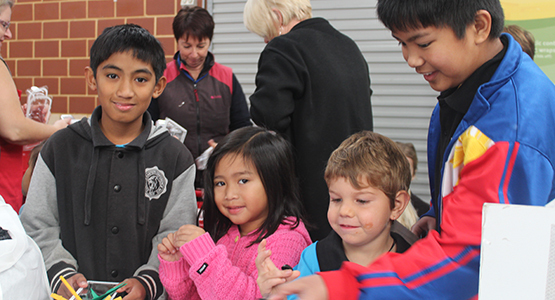 The team also visited West Northam Primary, Bakers Hill Primary and Wundowie Primary. CAN I RECYCLE: PAINT TINS? 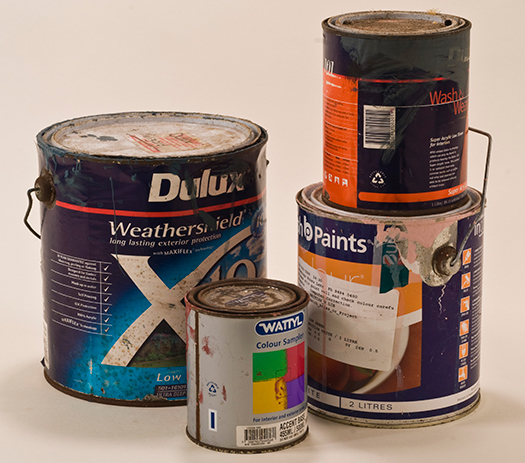 Paint is classed as Hazardous Household Waste (HHW) and needs to be taken to a disposal site. Even empty paint tins should not be placed in your yellow topped or green topped bin as they will contaminate and compromise the recycling and composting processes. Photo: Nappies that were mistakenly put in the recycling bin. More and more used disposable nappies are finding their way into yellow-topped bins and ending up mixed in with recyclable material at our Material Recovery Facility (MRF). This is an issue for many reasons. While nappies are an unpleasant surprise for our sorting staff, the greater problem is that human waste seriously contaminates bales of recyclables and impedes our ability to recover materials. This can result in consequences as damaging as export bans and potentially recyclable materials being sent to landfill. All nappies, including biodegradable versions, should be placed in your green-topped bin. To help the environment, try using cloth nappies instead. Babycentre.com.au has some great tips. â€œSingle-useâ€ includes plastic shopping bags, plastic cups, straws, plastic packaging...basically anything thatâ€™s intended only to be used once and then discarded. As we all know, one of the key ways to reduce your impact on the planet is to reduce, reuse and recycle. Donating unwanted clothes or buying â€˜newâ€™ items from an op shop is a great way to ensure goods donâ€™t enter landfill. National Op Shop week runs from the 23-30th of August. 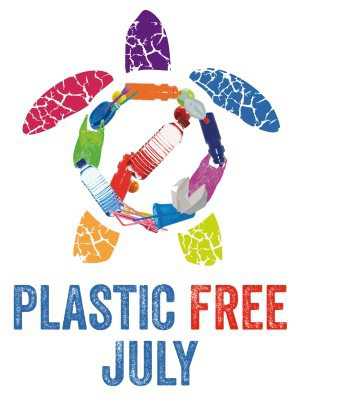 Keep Australia Beautiful Week is held in late August each year to raise awareness about the simple things we can do to reduce our impact on the environment and encourage positive action. 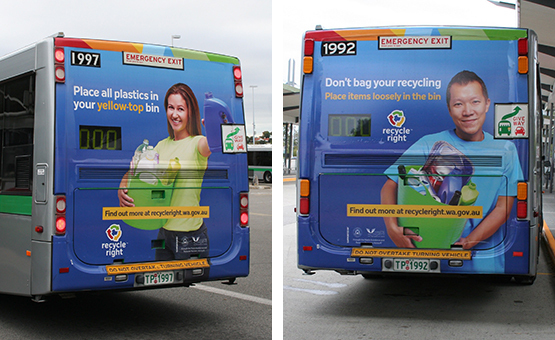 You may have noticed some Recycle Right branded buses travelling around the southern suburbs recently. Weâ€™ve created some colourful adverts to spread the Recycle Right message far and wide. Each bus has an essential tip to encourage recycling which will make a big difference to the environment. Each piece of information targets a common mistake made by households and suggests a simple solution. Even broken glass should go in the yellow-top bin. These bus adverts will also shortly be joined by a fleet of branded waste collection trucks in Fremantle, Melville and Cockburn councils. During May our Education Officer, Emma Baker, helped the Year 1 students at Atwell Primary School make paper from recycled egg cartons. 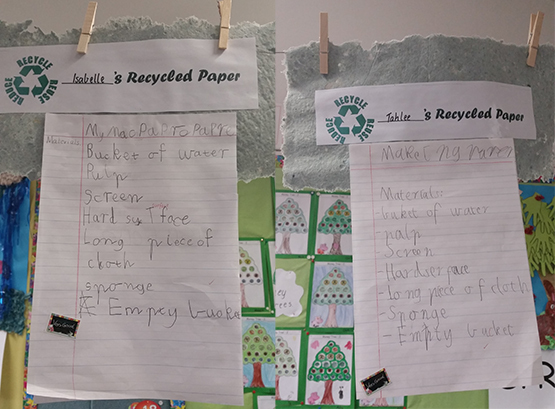 Mrs Baileyâ€™s class used the opportunity to practice writing a procedure, as well as improving the childrenâ€™s knowledge of recycling. â€œWe all really enjoyed having Emma at Atwell this term. 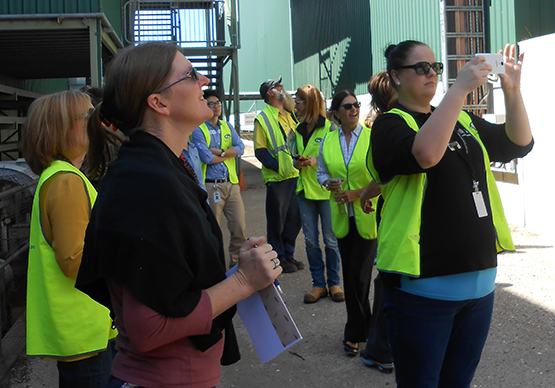 The kids really liked making the paper and learning about recycling,â€ she said. For more information on how a visit to the RRRC aligns with curriculum content, check out our website.